“There is more to Gerard Stiles than meets the eye!” Desmond declares, so Randall runs off to search Gerard’s room for something incriminating. But what does meeting the eye have to do with anything? There’s more to a lot of things, you can’t just ransack other people’s personal property because of a perceived insufficiency in eye-meeting. But it turns out Randall is one of those doomed investigators who pop up in Collinsport at irregular intervals, not for very long. Sometimes they’re policemen, or doctors, or psychics — someone with a little bit of soap opera authority, which makes them fun to mess with. This one’s a lawyer. It’s usually okay to dispose of lawyers, because you can always get another one. Anyway, there are three lawyers on the show at the moment, and you only need two, even with a witch trial approaching. Vicki’s witch trial only used one lawyer, and look how well that turned out. So Randall goes on a fishing expedition in Gerard’s bedroom, hoping to find a voodoo doll or Watergate tapes. What he finds is the bejeweled golden mask of the notorious drag sorceror Ms. Judah Zachery, which came from who-knows-where and is relevant to no known plot points. It just sits there, and glitters. Randall stares at it, mouth agape, and learns nothing. Honestly, it’s impossible for somebody to investigate on this show right now, because every character with a speaking part is guilty of some kind of tort or malfeasance, so all the investigator can do is just ping-pong back and forth between them, assembling meaningless clues and suspecting everyone, until one of the malefactors finally decides that enough is enough, and brings down the banhammer. 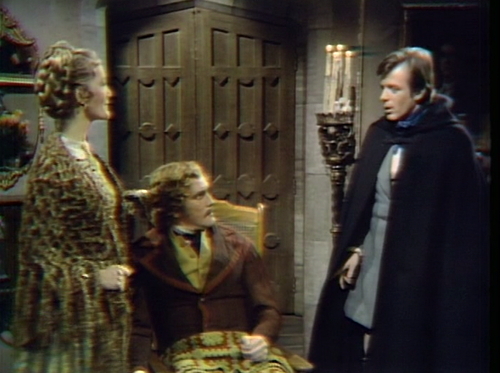 There’s not really anywhere to go after finding an unexpected gold mask, so in walks Edith Collins, a soap vixen played by somebody who used to be on Dark Shadows. Edith’s husband Gabriel is confined to a wheelchair, and Edith doesn’t like him, so every once in a while she slips away from Collinwood and walks over to Rose Cottage, for a secret rendevous upstairs in Gerard’s room. 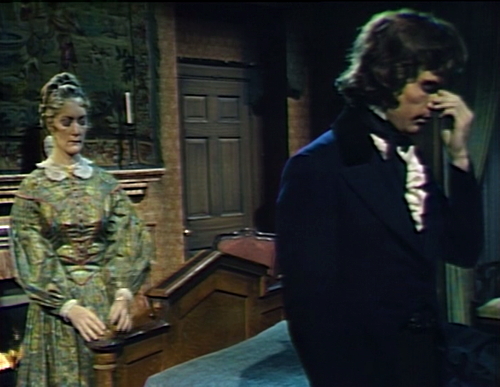 Randall and Edith both treat her entry into a man’s bedroom as scandalous, although I have to imagine that at some point the three other people who live at Rose Cottage must have seen her enter the house and slip upstairs for extended periods. Who let her in? “I don’t know,” Edith says, crossing her arms. “She hardly knew him.” This is true, and the utter irrelevance of Randall’s question highlights how much disconnected villainy is going on these days. But the real purpose of this encounter is to give Randall a secret that someone would rather not spread around. Randall’s going to collect several secrets over the course of the episode, because in seventeen minutes, he’s going to be murdered, struck down by a pair of mystery feet, and it’s always good to stock up on motives. 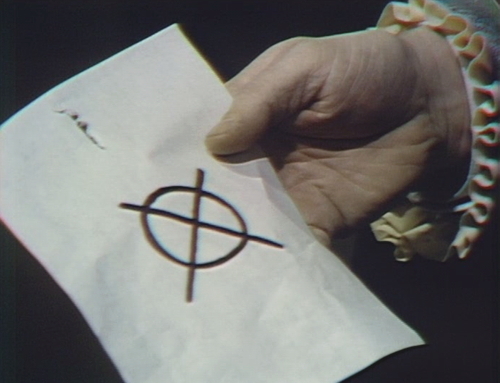 They don’t usually do murder mysteries on Dark Shadows, because on the whole, the show prefers the up-front scheming of a Snidely Whiplash type, quietly cackling to himself in the corner as he draws a pentagram on the floor and prepares his latest outrage on the public weal. But in this storyline, there are so many potential perpetrators that it’s hard to tell who’s done what. 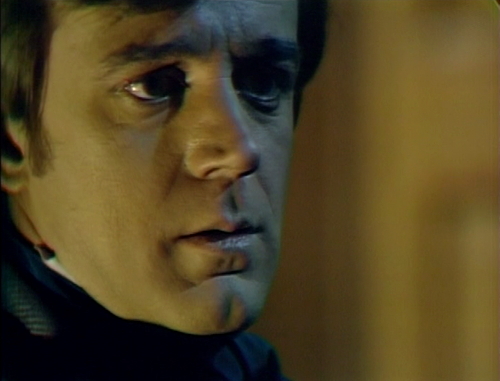 Gerard is the lead villain, with Dawson as his henchman, but there’s also Angelique, and Trask, and Edith and Gabriel, and Laszlo, and, if we’re going to be honest with ourselves, Barnabas. Quentin’s kind of a loose cannon as well. Samantha’s got a lot of unfulfilled resentment, and she’s probably behind at least one of the current mysteries, which now that I’m listing them it’s kind of amazing that they think the audience can possibly keep track of it all. By the end of the day, they’ll add another charge to the endless collective rap sheet, and based on Randall’s default facial expression, I think he knows what’s coming. He must have known it all along. 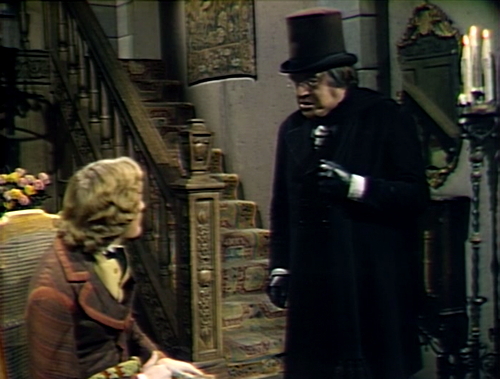 To keep things lively, we head over to Collinwood to welcome a new character — Mr. Mordecai Grimes, a local farmer who dresses like Ebenezer Scrooge for reasons that are not immediately apparent. He’s got a grudge, a stovepipe hat, and a sour expression, and I for one am entirely enchanted by him. He doesn’t even knock, he just walks in and starts glowering. But Grimes’ farm is next door, apparently, and that would make anybody a bit touchy, dealing with the surface runoff of evil sorcery that tends to accumulate in stagnant pools around Collinwood every fifty years or so. It’s no wonder he’s indulging in Christmas Carol cosplay. The immediate environmental concern is that his cows broke through the fence yesterday, and today they’re all dead, apparently without external cause. They just died of a broken heart, one after the other, and Grimes is wearing black because he’s taking a break in the middle of a long string of cow funerals. Now, you and I know that there’s a certain member of the Collins family who’s known to be a clear and present danger to the cattle, but Grimes doesn’t know that, and he considers this just another inconvenience caused by the toxic metaphysical geography of the Collins estate. “The whole town knows what’s happening in this house!” he says, which is amazing, because even the people who live here are having a hard time keeping up. This is the fall of man, an accursed Eden where neighbors drop by unannounced, to accuse you of committing nameless crimes against farm animals. “What about the killin’ of Lorna Bell?” Grimes says, “What about the weird things that have been happening ’round here lately?” Quentin doesn’t know. What about them? Quentin tells him to get out. “Leavin’ here won’t stop me thinkin’ the way I do!” Grimes bellows, and that’s when Quentin comes at him, with wild eyes. And as his feet hit the pavement, Grimes thinks to himself, Was there anything in that encounter that I could have done differently? On the walk back to his miserable, cowless farm, Grimes gradually becomes aware that he’s being followed by a pair of mystery feet. He can’t see the man’s face, and more to the point neither can we, so he decides that it’s someone who wants to murder him, which happens to be exactly correct. In this demon-haunted jurassic park, the people who in real life would have been delusional conspiracy theorists are actually the hard-nosed, practical realists. Paranoia is a logical response to this environment. So he pulls out his loaded six-gun, which he keeps on his person at all times. Grimes has a complex antisocial life. The mystery feet stand their ground. And then he fires blindly, into the foliage. The shot misses, of course; the mystery feet just turn and walk away. You can’t rile mystery feet; they’re cool customers. Now Grimes is just standing there, looking silly. Randall happens to be passing, and Grimes latches on to him, saying, “It’s Quentin Collins, he’s after me! Help me catch ‘im!” And Randall just follows, which is a testament to Grimes’ powerful natural charisma. Those two statements — he’s after me, help me catch him — are mutually contradictory, but Randall is eager to help anyway. It’s also possible that Randall is an idiot, and he’ll follow anyone. It’s probably a mix of the two. Now, if you ask me, this is a miscalculation on the part of the mystery feet. Grimes is clearly a threat to public safety, ready to open fire on any nearby pedestrian, and now they’ve given him a dagger. Back at the boudoir, Gerard returns to his room and finds it full of unexpected Edith. She simpers at him and he kisses her, then turns away. “That’s what you came for, isn’t it?” he snaps, but she’s unfazed; that is what she came for, she wants more of it, and she doesn’t care what she has to do to get it. Alienation, adultery, random gunfire, cow poisoning and black magic; it’s like a Southern gothic that got lost, and wandered northeast. Naturally, after a minute or so, she runs out of conversation and spills the news that Randall was here, messing around with the desk. Gerard sees that the lock was forced open, and now Randall is running around loose with the intel that Gerard has a mask in a box. She’s still simpering. “You know I’d do anything for you,” she says, and he takes that as his cue to begin issuing baffling instructions, in fluent Gerardspeak. That didn’t quite go off as planned, so Gerard paces across the room and tries again. “I wish I knew what you were up to,” says Edith, and for the first time, the audience entirely agrees with her. But it’s a big evening for not knowing what people are talking about. When Edith gets back to Collinwood, all she finds is her crummy husband, but then Randall shows up, which means that now she’ll be able to know and tell Gerard everything, find out who Randall’s talked to, and make sure he doesn’t get rid of her, in that order. And then he brandishes the piece of paper that he found stuck to a tree, which he expects Edith and Gabriel to be able to explain at a moment’s notice. So let’s delve for a moment into the mystery of what the hell is happening on daytime television right now. Randall found that paper in the woods, en route between Collinwood and Grimes’ farm, and now he’s planning to go to the police to tell them… what, exactly? That somebody drew a circle? And why would Edith and Gabriel know anything about it? I think Randall is just brandishing for the sake of brandishing. This is especially head-baffling, because this paper was found at the scene of the crime that Grimes committed — i.e., attempted murder of whoever was walking in the woods behind him. This is not evidence of anything. “Now I know that there was something supernatural about my sister’s death!” Randall proclaims. He saw his sister after her funeral, by the way, sizzling in the sunlight as he held out a cross to keep her away from her own coffin. But the piece of paper! So I don’t know, you’d think with so many lawyers around, somebody would be able to understand what they’re accusing each other of. Randall rushes off to meet Lamar in the park and then go to the police station, to show them the piece of paper and see what happens. So Quentin rushes out to find Randall, and so on. I don’t know what everybody else is doing. And that’s how Randall dies, thank goodness, standing in the park right across from the police station, surprised by a pair of mystery hands in the night. And the culprit is… the cows! I bet you didn’t see that one coming. Quentin tells Grimes, “If I were you, I would watch what I said to anyone else!” Grimes’ reply — “Or what?” — is said so quietly that you hardly know he’s saying a line; I only caught it because I was going over that part of the conversation a bunch of times to get a screenshot. 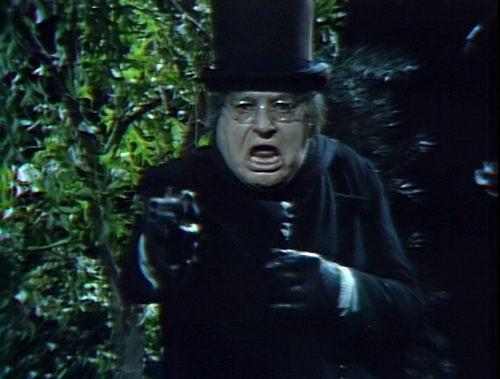 In act 2, as the scene shifts from Quentin walking upstairs to Mordecai in the woods, off-screen whispering can be heard. When Gerard looks around for a place to hide the box, the place that he puts it does not, architecturally, exist. This is Gene Lindsey’s last episode on the show. 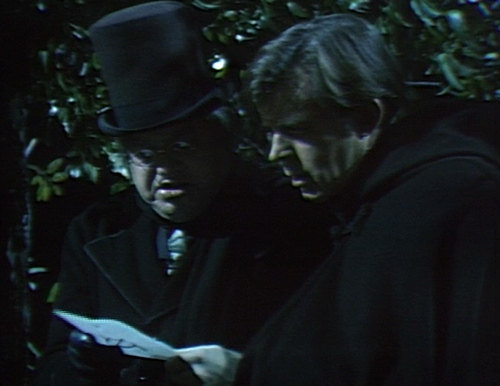 After Dark Shadows, he appeared on the CBS soap opera Love Is a Many Splendored Thing, and he had a small part in the 1976 film All the President’s Men. I lost track of him after that. Before DS, Gene Lindsey appeared in the 1964 film classic, ‘Santa Claus Conquers the Martians’. Mr. Lindsey also had an uncredited role in 1970’s ‘Cotton Comes To Harlem’. Unless they’re talking about a different Gene Lindsey. You know how They are, always trying to confuse us. This late in the series, and the writers are now reducing to focusing on cows. 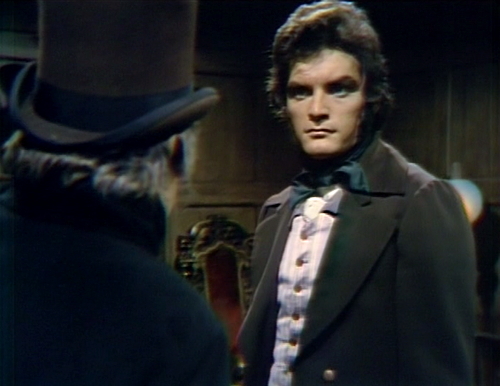 “Dark Shadows” is clearly milking this for all it is worth. ( Oh, come now, SOMEBODY had to say it ). It’s a ‘dairy’ interesting idea, but ‘cud’ we just ‘moo’-ve on from this and put it out to pasture? A few years ago I asked Donna Wandrey about her memories of working with Gene Lindsey. She said they hit it off immediately and Gene became like a big brother to her in real life while they were working together. Donna said for years afterward, she’d see him on the subway on his way to an audition. She said it had been a long time since she had seen him and admitted she didn’t know if he were still living or not. It’s a good thing she didn’t hold a grudge against him since his character was responsible for her character being written out of the story. When I read a line like “And the culprit is…the cows!” the first thing I imagine is The Far Side. I don’t blame Edith for running down to Gerard’s room at rose Cottage every chance she gets. Even if Gerard is possessed by a head in a box, he’s still more fun than Gabriel. Say, whatever became of that head, anyway? I’m starting to kinda miss it. Wonder why Gerard didn’t just put the mask on the head, and hide both in the same place? I mean, Randall didn’t find the head, so it must be hidden in a better spot. Poor Randall – Requiscat In Pace. Sic Temper Insipiens. While I think of it, are they going to try to put the Legendary Head onto another (probably non-legendary) body? I mean look how many times they tried to get Adam (and then Eve) up and running! Or don’t they want to pay another actor? And I suppose a head in a box is creepier than a head with a body. I think Charles Dawson has the head. I wonder if Danny misses it as much as you do. 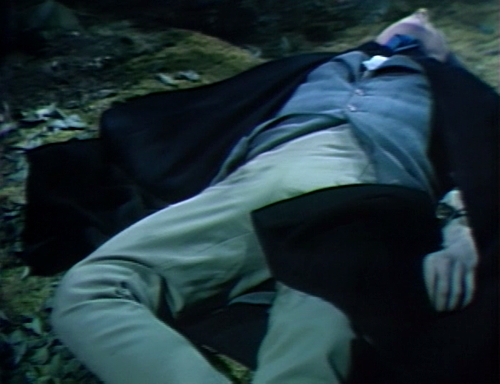 I’m sure he misses the “Dead of Night” theme that played every time we saw the head. Where is the body? Are we absolutely sure it was destroyed in the laboratory fire? Maybe it’s at Dawson’s house, too, bumpin’ around, busting up furniture and Satanic ritual equipment. Dawson deserves to be saddled with the body AND the head of Judah Zachery – the houseguest(s) from Hell. 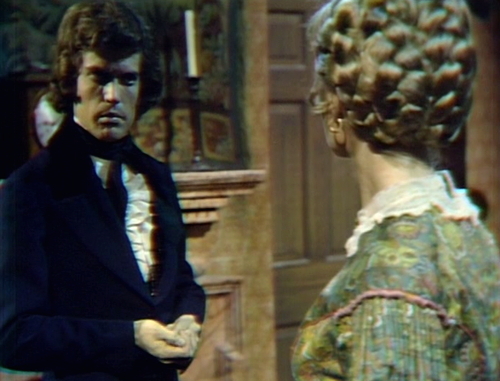 Former Dark Shadows writer Malcolm Marmorstein is going to be at the festival in LA held later this month. I do want to ask him about the writing process for the show, especially when it came to long-range plans (ha ha ha) and/or winging it as they went along. I do remember from an interview that he said he was fired from the show, so maybe he will be honest since he has nothing to lose. It’s lonely being the only Fan of 1840. I even liked Randall. Someone needs to, right? Anyway, this was hilarious and made my day. I think what really must make the mark the sign of the devil because I’m pretty sure that’s magic marker it’s drawn with and that won’t be invented for quite a few decades yet. Never understood why Thayer David played Mordecai Grimes when Professor Stokes will soon be appearing and Grimes is in only a few episodes. I always thought Randall had sort of a John Davidson kind of thing going on. Also, “Disconnected Villainy” would be a great band name. Admittedly, Barnabas has “form” when it comes to cattle, but- A whole herd of them? In one night? He must have been REALLY hungry all of a sudden. Maybe cows are like potato chips; hard to stop at just one? 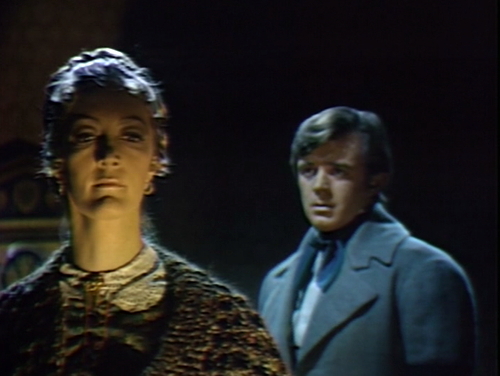 Ugh, watching Edith and Randall play a scene together is like watching two blocks of wood. 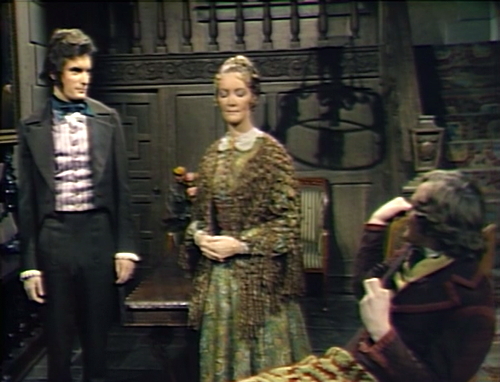 These two were dreadful actors and generated zero energy. Thank heaven Thayer David was back for this episode.